No reviews yet for this trip. Browse other reviews below for Butterfield & Robinson. Drive through desert landscapes and view hidden Berber villages where it feels like time doesn’t exist. Bike on the outskirts of the small village of Skoura at the foothills of the High Atlas Mountains and through the Almond Valley. 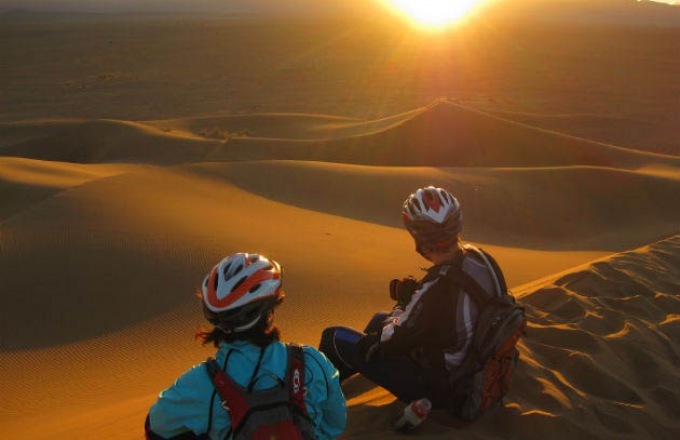 Bike along the road of the Oasis of Foumzguid to find camels waiting to take us into the desert sunset for an unforgettable night of dancing and feasting under millions of stars at our private Berber camp. Cross paths with camels, goats and smiling kids on donkeys as we bike back to Skoura past kasbahs and lively local villages. Embark on a modern-day caravan over the High Atlas Mountains following the same route travelled several centuries ago. Bike along the foothills of the Atlas Mountains amongst olive groves and passing along natural landscapes. We head into the foothills of Mount Toubkal, the highest peak in North Africa today to the remote Berber village of Around before lunch on the terrace of our local guide’s guest house: Dar Ouassaggou. Your B&R guides will keep you entertained during cocktail hour this evening with a surprise cultural event! Bike toward the holy city of Moulay Brahim and the hidden “Plateau de Kik.” Here, an amazing picnic awaits you with fantastic views on the Lalla Takerkoust Lake. Explore the intricate city of Marrakech lead by our famous local guide Mohamed Bouskri. We'll have lunch at his place before an amazing last night. Enjoy a farewell breakfast at the hotel and m’a ssalama in Marrakech before your final departure. Located within the palm groves of Skoura, this relaxing kasbah features serene guest rooms, a gorgeous turquoise pool and soaring views of the mighty Atlas Mountains. Our Regional Expert for Morocco reports that the property is possibly the best he's seen in his 18 years in the country. Our private Berber Camp in the middle of the desert is not just magical and romantic—it’s also very comfortable. The camp features double and twin private tents furnished with rich carpets, warm blankets and very comfy beds, so you’ll sleep like a Berber and a baby at the same time! Once owned by an Italian antique collector, this unique mountain retreat is tucked away in the midst of the Imlil Valley. Surrounded by the High Atlas Mountains, rose gardens, almond groves and fruit trees, B&R is proud to be the only biking company accepted at this impressive property. Between 270-95 days prior to departure each traveler will be charged $500 to cancel or the traveler may choose to keep the full US$1,000 deposit in a holding account with us for a future trip. Daily biking distances usually vary from 20 to 50 km (12 to 30 mi. ), with options on some days as far as 62 km (40 mi.). The terrain is generally flat, with a few hills along the way when we’re closer to the High Atlas Mountains. The difficulty of the ride often depends on which way the wind is blowing. The walking routes are mostly flat, except for our day in the Atlas Mountains. You can’t enjoy a great biking trip without a really great bike. On this trip you’ll be riding customized Cannondales; there are three models to choose from to ensure you’ll have the perfect bike. We also equip you with handlebar bag, helmet and water bottle.